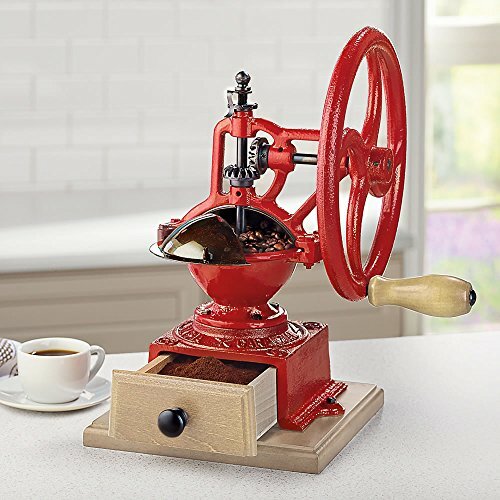 Available only from Hammacher Schlemmer, this is the coffee grinder designed in Italy by the same company that crafted the original 1894 model. It provides contemporary coffee drinkers with the same rich profile enjoyed by espresso consuming citizens in turn of the century Turin. Unlike contemporary electric units that generate heat which creates a bitter coffee experience, this manual mill produces minimal heat and helps preserve the beans' original aroma and flavor. Its hopper holds 1 3/4 oz. of beans as the hand crank provides optimal torque for smooth rotation of the conical grinding mechanism. The knurled nut below the handle rotates to produce a coarse grind for a French press or a fine grind for drip coffee. If you have any questions about this product by Tre Spa, contact us by completing and submitting the form below. If you are looking for a specif part number, please include it with your message.